Tag-wiki is an editable page that briefly summarizes the topic of the tag and that may provide links to existing questions that are often useful to many people. 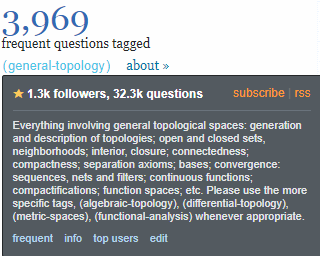 Sometimes tag-wiki also includes short guideline about which questions are appropriate for the given tag. You are currently reading the excerpt of a tag wiki. An editable page that briefly summarizes the topic of the tag and that may provide links to existing questions that are often useful to many people. Sometimes tag-wiki also includes short guideline about which questions are appropriate for the given tag. You are currently reading a tag wiki. The excerpt which is displayed on question lists and tag hover menu. It is the part shown when clicking on the "show excerpt" link in a tag wiki. The body which contains detailed information about a tag wiki. When the excerpt is displayed there is a clickable item, usually labelled "info" or "learn more" that will cause the body to be displayed. See also: What is a tag wiki? How do I write a good one? Should we improve the fibonacci-numbers tag wiki to allow for variations in $F_0$? Do we actually “welcome questions about: • Software that mathematicians use”?